OverviewLuminous Arc 2 is about a young knight and friends that gets caught up into a battle with saving the world. 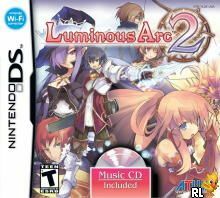 Luminous Arc 2 is similar to luminous arc 1, a RPG. Most of the game consits of conversations between characters and some turn based battles in between. You also come across some frienship events, here you can choose a character, have a conversation with it and raise your frienship level. 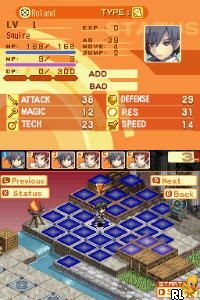 The battles are turn based and consist of some stages: 1. you 'move', you can walk a certain amount of squares. 2. you 'attack' or use 'magic or a skill' or use an item. Then an other character can perform these moves. The order in which the characters can fight depends on their speed. If you like a cool story and/or some exiting battles, than this is a good game for you! Now you can add videos, screenshots, or other images (cover scans, disc scans, etc.) for Luminous Arc 2 (U)(XenoPhobia) to Emuparadise. Do it now!